Metro Manila residents are being crucified this summer on the twin planks of a severe water shortage and recurring power outages, all amid sweltering record-high temperatures brought about by the El Niño phenomenon. There is precious little that we can do about the weather, but it is now clear that the government agencies and private corporations that were tasked to ensure we have a stable supply of water and power—bare necessities for civilized living—have failed us miserably. 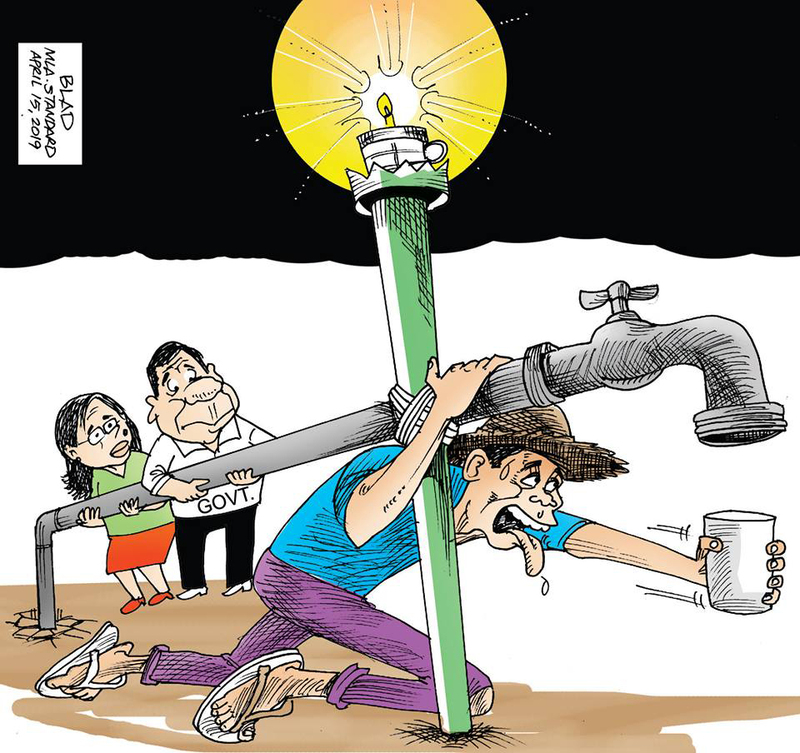 Manila Water, the concessionaire for Metro Manila’s east zone, has apologized for this failure, but that apology is hardly sufficient to compensate the millions of its customers who suffered, many of them for days or weeks without water service. The belated apology from the Zobels—the billionaires who own the private water concessionaire—meant nothing to the thousands of small businesses that had to close shop because of they couldn’t continue operating without water. They may not realize it just yet, but the water service interruptions are not a mere inconvenience, and the public disdain for their company will quickly turn to rage in the punishing summer heat. Then, just when we thought we had seen it all, the National Grid Corporation of the Philippines and the Manila Electric Co. began carrying out rotating power outages, depriving neighborhoods of power for as long as three hours a day. One of the reasons, they said, was the lack of supply from power generating plants, some of which had gone offline unexpectedly. The Senate, as it should, has announced that it will evaluate the performance of all concerned corporations amid the water and electricity shortage. The current sad state of affairs, we are told, is all the more reason that the New Public Service Act must be passed to review the franchises and performance of public utilities, including those involved in the transmission and distribution of electricity, and waterworks and sewerage systems. The legislation recognizes public utilities as natural monopolies that must be regulated and penalizes those that do not perform up to par. But million-peso fines may be inconsequential to large corporations with billions of pesos in profit. More importantly, these fines do not go to the consumers who suffer the poor service. President Rodrigo Duterte recently ranted—with good cause--against an agreement with Maynilad Water Services, one of the private water concessionaires, that barred the government from interfering in the operation of its water system. The private company took “interference” to mean delaying a scheduled rate increase and sued the government before an arbitration court in Singapore for P3.42 billion, a case that it recently won. It is time that the government—and our legislature—put consumers ahead of the private corporations that put their profits ahead of the public good. Topics: Editorial , Enough is enough , El Niño , water shortage , power outages , Manila Water , National Grid Corporation of the Philippines , Manila Electric Co.